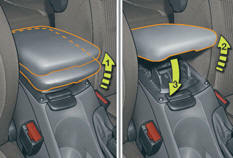 The height and length of the armrest cover can be adjusted for greater comfort. Raise the cover to the required position (low, intermediate or high). If you raise the cover slightly beyond the high position, guide it when lowering it to the low position. 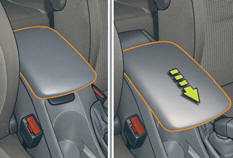 Slide the cover fully forwards or rearwards. 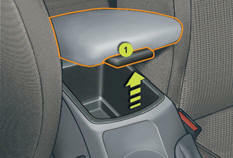 The armrest's compartment can hold up to 6 CDs. Raise the lever 1 .